For periods Assyria was the superpower in what we now call the Middle East, with the last or 'late' empire ending in 612 BCE. During that time it was military might that kept the empire together, and Assyria's army under a number of strong kings was indeed formidable. That army is starting to be represented in 1/72 plastic, and this is the first set from HaT in their Assyrian range. Half the poses in this set are of archers and slingers - both very important elements in the Assyrian infantry. Each type has one man loading and another firing, which is reasonable. The rest of the figures are infantry armed with spears, but the last two poses (on the top row) are adaptable. One figure has a ring hand into which one of the provided spears could be thrust as we have done, but he could also be given the axe or mace (which is the bottom part of both the standard and the axe) to hold. The last man has his right hand raised and cupped, allowing him to hold any of the separate items including the standard. Officers generally carried the mace, but were otherwise little different from their men in costume, so this man can be made into an officer. 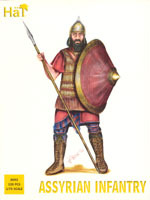 All the men wear lamellar armour and the characteristic Assyrian helmet, and all aspects of their costume are entirely authentic. The box tells us that these figures are for the seventh century BCE, which was the last golden age of the Assyrian empire and a time when the bulk of the infantry was unarmoured apart from the helmet. Therefore these figures are of heavy infantry, the elite of the army. Normally we add shields to figures before they are photographed, but in this case we have not for two reasons. First, by keeping them separate we can show all the styles on offer, and highlight the fact that there is more than one per man, allowing some flexibility. The different shapes and sizes allow different types of infantry to be created, and also different periods to be covered. Second, in some cases these authentically large shields would have all but completely covered the figure itself! The men have pegs on their arms, and the shields have raised 'holes' into which this peg fits very well. The circular shields are deep, which is correct, but the necessary depth of the shield hole means it is held a short distance in front of the man's hand, which is not a show-stopper by any means, and can be resolved by abandoning the peg/hole idea and gluing the shield directly onto the depegged arm if desired. The detail and general sculpting on these is very good indeed, with almost no flash to contend with. The detail is nice and deep and should make a great base for painting. On some of the figures adding the particularly large shield makes them a bit unsteady (as it must have done the Assyrians themselves), so a bigger base might have been a good idea here, but the plastic used is quite soft and is easy to bend so the figure becomes more stable. Our only particularly negative observation is with the sword scabbards and the quivers, both of which are considerably too short. This is not so apparent with the scabbard as there are no swords on show, but the 6mm long quiver is supposed to accommodate the 12mm long arrows. That aside this is a welcome return to form for HaT, and as a bonus these figures match very well with the corresponding Caesar Assyrian Army set in terms of size, quality and style of costume (see comparison below). A good start for the new range.